Samsung profits face squeeze due to "intensified smartphone competition" | What Hi-Fi? Samsung profits face squeeze due to "intensified smartphone competition"
The increasingly competitive nature of the smartphone market appears to be taking its toll on Samsung after the Korean electronics giant revealed that its earnings for the third quarter will be lower than previously predicted. In a statement, Samsung Electronics said earnings for the three months ending 30th September will "decrease substantially" when compared with the previous quarter, squeezed by "intensified smartphone competition". Samsung is now expecting to report sales totalling around KRW47tn for the period, alongside operating profit of KRW4.1tn – that works out at £27bn and £2.4bn respectively. Its Q3 results are due out later this month. 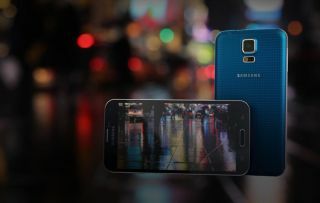 Mobile World Congress was the setting for the launch of Samsung's latest flagship smartphone – the Galaxy S5 – in February, and we think it's the "slickest Galaxy phone yet". Yet it wasn't able to earn a five-star review. Other Android competitors also unveiled in the first half of 2014, such as the Sony Xperia Z2 and LG G3, wowed us to a greater extent. And now the Xperia Z3 and Apple iPhone 6 have both arrived, too. The competition isn't just coming from the established manufacturers either, with Amazon among the new entrants to the market with the Fire – complete with its "two new breakthrough technologies" on board. A Samsung spokesperson said: "Smartphone shipments increased marginally amid intense competition. However, the operating margin declined due to marketing expenses related to aggressive promotions and lowered average selling price". The Korean manufacturer also revealed that it was experiencing "an adverse effect on the performance of the OLED and S.LSI businesses". The manufacturer said there had been "weaker seasonal demand" for its Consumer Electronics arm, which includes the TV market.